Once again I feel compelled to warn you of impending spoilers for the story of Battle for Azeroth. Of course, the usual caveats apply — this is the alpha, everything is subject to change, and we aren’t getting the whole picture from these bits of dialogue that the folks at Wowhead have datamined out. If you don’t want spoilers for what’s coming in the next expansion, don’t click that link or read further in this post. Now, let’s discuss what we’re looking at and what it might mean. It turns out that Jaina’s mother didn’t take it kindly when Jaina stood back and let her father die. Katherine Proudmoore rules Boralus and Kul Tiras as Lord Admiral, but the relationship between her and her daughter is less than cordial. 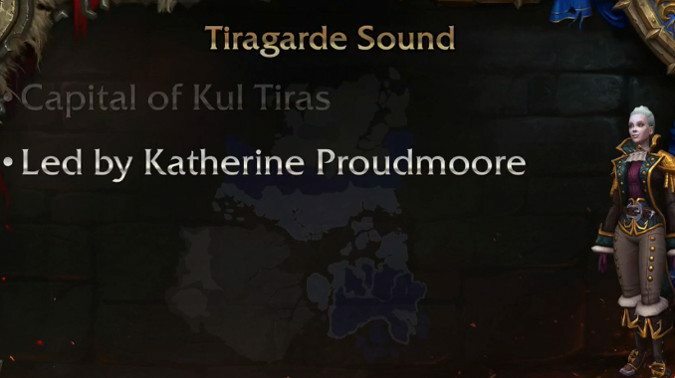 Katherine Proudmoore turned us away and had her own daughter cast out as a traitor. So why are you helping us? Hmph… Let me tell you a story. Many years ago I was in a battle – well, I was in several battles, but this story is about one in particular. An orcish juggernaut struck our transport. Splinters from the gunnel ripped across the deck and found their way into the man next to me. A friend of mine. His wound should have been a ticket home, but he was ashamed to leave the war before we’d finished it. So, he patched himself up and lied to the medics. Days later my friend died in his bunk, screaming and drenched in sweat. His wounds had closed, but infection had set in. By the time he asked for help, it was too late. This bit of text reveals quite a bit about the situation in Boralus and throughout Kul Tiras. While Katherine Proudmoore has stewed in her anger and hurt after her daughter allowed her husband to die, she’s let control of the nation slip a bit. The Ashvane family has been able to slowly usurp much of the day-to-day control of the nation — and they’re using it. Players investigating their sinister plans will eventually come to the realization that Lady Ashvane is in league with sinister forces and has designs on the whole of Kul Tiras. Katherine Proudmoore has her people’s best interest in mind, but she is misguided. 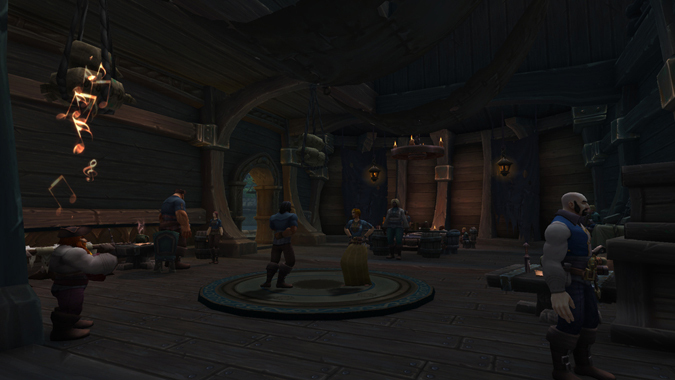 Kul Tiras still bears the scars of the Third War – nobody knows this better than Katherine. What she cannot see is the infection that has been allowed to fester and spread throughout our kingdom. I will stay quiet no longer. We need the Alliance as badly as you need us – perhaps more. Wise words. We shall prove to Katherine Proudmoore the truth that I myself learned at great cost. Eventually, there’s an armed confrontation between the player and the forces of Lady Ashvane. During this, Ashvane betrays her close friend Katherine Proudmoore and attempts to usurp control of the entire nation, seemingly at the behest of Queen Azshara herself. At the same time, other forces are stirring in the island kingdom. The Tidepriests, who traditionally guide the infamous naval forces of Kul Tiras into safe harbors, have retreated and the navy’s location is currently unknown. Meanwhile, the Waycrest clan has become utterly unresponsive in the moment of Kul Tiras’ greatest need. Clearly some heroes are going to be needed. Some of the dialogue indicates that the Alliance and Horde engage in a war of spies and scouts, with each group sending clandestine agents to the other’s hopeful allies. While the Horde investigates Drustvar, the Alliance infiltrates Nazmir. While the Horde dialogue is fairly innocuous — a typical exchange between a profit-minded Azerite hunter and a loyal Horde agent — the Alliance text is more interesting and should be looked at in detail. We sent Captain Conrad ahead to build a fort. They say the blood trolls here might even be willin’ ta trade, but I cannae imagine that’d come at a price worth payin’. Still, this here’s a land that works ‘gainst the Zandalari and their Horde associates. The enemy of yer enemy is yer… wait, what’s that sayin’? No matter. Look. Listen. Keep those sharp eyes peeled. Unforgivin’ lands aren’t known ta forgive the unwary, $n. And… eugh… keep yer nostrils pinched. What’s that foul-as-death rottin’ stench? Looks like our welcome party is here. Harry’s an interestin’ one. Don’t pay him no mind. We’ve been expecting you, our esteemed advisors and future fast friends. Captain Conrad left me with instructions. If you saw that name and thought, “Wait a minute!” you caught the Heart of Darkness reference. And yes, it definitely turns out that much like Kurzen in Stranglethorn, Captain Conrad has not been dealing well with her exposure to sinister Troll magic. Still, the Alliance is out to disrupt the Horde in Nazmir, so maybe the Blood Trolls can be reasoned with? It seems like a sound idea, until you start looking deeper. Ah! Ah ha! Right to the point, yes, yes. Not to worry! All is in order. Let’s retire to safer environs behind our fort’s walls, yes? Alright, no sign o’ the Captain then. What’s goin’ on? Nothing untoward, I assure you! Our glorious Captain is off negotiating trade agreements with the local trolls. Heard they were savages wot practice bloody sacrifices. Oh heavens! Well, indeed, yes. I suppose that is accurate, mmm. But Captain Conrad is a glory to behold. Impressive, no doubt. Trade agreements with trolls! We even have bats prepared to send another trade offering to Zala’mar. Blast that! They won’t get another red copper from us before me an’ $n go see what’s what. Investigating the “trade deal” that Captain Conrad has negotiated goes about as well as you’d expect if you know the basic story of Nazmir. The player heads off to find out exactly what kind of “deal” Captain Conrad has negotiated with the Blood Trolls, and it’s exactly the kind of deal you’re already suspicious of. What’s this all about, Harry?! Those offerin’s you were sendin’… The soldiers were sacrificed! Blood drained from their bodies like a mug o’ ale at Brewfest. My… oh my goodness. Surely the esteemed Captain Conrad had no knowledge of these macabre circumstances. Knowledge or no, it’s time to get to the bottom o’ this. Where’d this Captain head off to? Zul’Nazman, I believe. Or Tul’vor? In fact I believe they are one in the same. Or nearly so. Captain Conrad… is well, I trust? WELL?! That lassie was madder than a murloc on moon mead. Tried to sacrifice our lovely $c here to some blood god called G’huun. Oh dear. That is much worse than I feared. My deepest apologies for putting you in such a risky situation, sir Bronzebeard. Eh, not the worst I’ve seen. Still a sad story, though. We’ll need to dispatch a messenger to let the High Commander know what transpired. While this is a lot more detail than we get for the Horde side, it’s definitely intriguing as it implies that the Alliance get caught utterly flatfooted when trying to infiltrate a region controlled by the Blood Trolls, since they’re unaware of their ties to the Old Gods and G’huun in particular. I’m still a little disappointed that Hakkar doesn’t seem involved in any of this — he was the Blood God before it was cool — but at least we’re seeing more advancement of the story between the factions. At the same time, there are datamined exchanges between various Horde figures (including Sylvanas) that imply that not all is well in the upper echelons of Horde power. 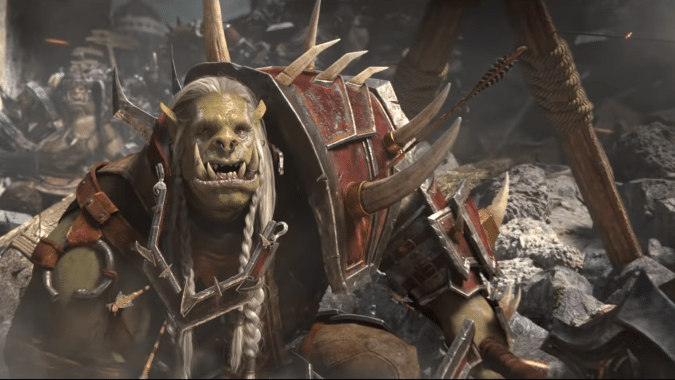 Sylvanas seems to want personal loyalty, while some like Saurfang emphasize that their loyalty is to the Horde as a whole and not any particular Warchief. Elsewhere, there’s also a datamined exchange between Anduin and Saurfang during the Lordaeron battle. Stand aside, Saurfang. This war is not yours to bear alone, and there is no honor in killing you. How dare you lecture me, boy? You know nothing of honor. I will NEVER stand down! I eat, sleep, and die by the sword. What price have you paid for your people? My father gave everything for the Alliance. The question is, are you willing to do the same? It’s nice that Anduin hasn’t gone all bloodthirsty while still being willing to get right up in Saurfang’s face. I still want more details on how this new conflict got triggered, but it definitely seems like it’s heating up. Sylvanas has some things to say about Anduin that are not flattering. Ah– there you are. I was beginning to wonder. I require the service of what appears to be a rarity– someone I can trust completely. Certain members of the Horde seem to feel my recent actions have been… indiscriminate. But I understand precision very well. To win this war, the Horde needs allies. The boy king has something that does not belong to him. I want it back. You are to infiltrate Stormwind and liberate a political prisoner who could completely change the course of the war– in our favor. This is referring to Princess Talanji, who the Horde liberates from Stormwind as part of the opening scenario to unlock the Zandalari as allies. 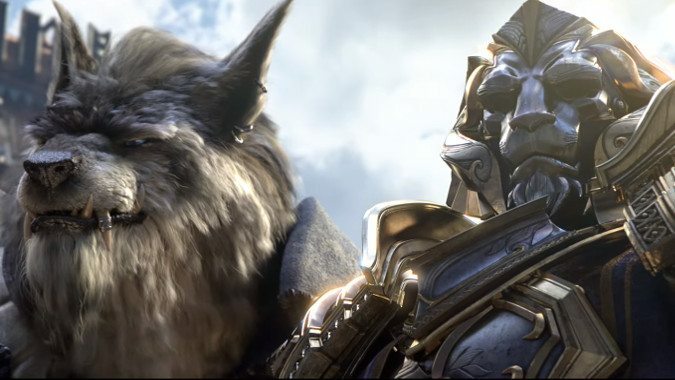 Hopefully Anduin won’t have to spend the entire expansion going by The Boy King but it’s not surprising that the Horde doesn’t respect him very much at the current point in the conflict. There’s a lot more to go over but for now we can say that the conflict is definitely heating up on all fronts in Battle for Azeroth. Head to Wowhead if you want to read all of the dialogue yourself.